From humble beginnings as YESTERDAY & TODAY back in 1974 Dave Meniketti has always fronted the band we now know as Y&T. This live concert, captured for posterity, is actually a celebration of the 30th Anniversary of “Earthshaker”, their finest hour according to many. Or their, the band consists of Dave on guitars and lead vocals as always, backed by guitarist/vocalist John Nymann, bassist/vocalist Brad Lang (who replaced longstanding bass man Phil Kennemore when he succumbed to lung cancer in 2011), and drummer Mike Vanderhule. Anyway…on with the show. To their credit the revamped Y&T perform no less than seven tracks off their latest effort “Facemelter”, including the rather nondescript opener “Prelude”. But I must say that the band, that had been rather shaky ever since “Contagious” back in 1987, seems to have found the right formula. Their latest album was high octane in the vein of the excellent “Blind Patriot”, “I´m Coming Home”, and “Gonna Go Blind”, and they work live too. Most of the stuff is spot-on, like “Mean Streak”, “Winds of Change”, “Hungry for Rock” to mention only a few. The only rather lukewarm moments are the oddly off “Dirty Girl” and “Don´t Bring Me Down”. The sound is excellent, maybe too much so, but still the audience is there even though the mishaps aren´t. 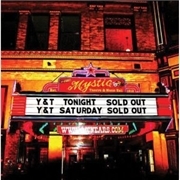 This album was picked in its entirety from two nights at The Mystic in California, the right setting for the band. If I could have them over here I´d make sure the only two somewhat less spirited moments were replaced by “Midnight in Tokyo” and “Don´t Be Afraid of the Dark”!